The owner of Stony Point Fashion Park plans a $50 million redevelopment of the South Richmond mall, the company is announcing in a release to media and reported in the Richmond Times-Dispatch. Sounds like a lot of money — five times as much as Short Pump Town Center spent on recent renovations. They seem to be targeting the more outdoorsy crowd. I may have some suggestions that won’t cost anywhere near $50 million. I’ve been going to Stony Point for years, but I’ve never been completely at ease with it. The development seems disconnected from the surrounding neighborhoods, the James River and the natural park land at nearby Larus Park. It needs more connectivity to those nearby assets. The biggest problem with Stony Point Fashion Park for me is that I cannot walk or bike to get there. I live about 2 miles away north of the river, but can’t get there by my preferred methods of transit. There are no buses there either, which means the mall, condos and surrounding office buildings are car-only. Why limit your customers and workers? Transportation to the mall is part of the problem and I want to fix it. A few years ago when I began my urban planning graduate studies at VCU (reminder, I finished in May 2015), my friend Sean Yeager and I talked ourselves into beginning our own study on the Chippenham Parkway (State Route 150) corridor. Our premise: There is no reason why a residential, 45 mph roadway with shoulders that has traffic lights and behaves like a neighborhood connector street (through the Oxford neighborhood) should not allow pedestrians and bicycles. The city of Richmond, Henrico County (north of the James) and VDOT can work together to make it happen. We need a champion to get a proposal before the Virginia Commonwealth Transportation Board. At the time, the Huguenot Bridge was under reconstruction, which severely hampered access to the bridge for all modes of transit, especially pedestrians and cyclists. We wanted an alternative, but neither of us had the time to pursue it. But many of the people we contacted said it was worth pursuing. I once saw a man riding his bike to Stony Point in the middle of a westbound lane on the Chippenham Parkway. It was right after a snow storm and the snow had been plowed over into the shoulder. I imagined that he man had no other mode of transportation and needed to get to work somehow. Denying him non-vehicular access to his job is discrimination. Saw a older gentlemen biking on Chippenham near Stony Point — takes guts in 20 degrees & snow. Plus, illegal. @VaDOTRVA can change that!.. GRTC does not offer bus service to Stony Point Fashion Park, which prevents access to the area for residents who rely on alternative means of transit (especially walking and biking). Additionally, that also prevents residents of the apartments at Stony Point Fashion Park from leaving the area by any means other than a vehicle. Providing access to Stony Point for pedestrians, bicycle commuters and recreational cyclists would help, especially if the mall owners are committed to creating more outdoors entertainment. Sure, most people who go to Stony Point Fashion Park will want to drive — that won’t change. The retailers will want you to have a vehicle to carry all of the stuff you buy too. But if you live nearby and could get there by walking or biking, wouldn’t that be inviting? If you live in an apartment there, wouldn’t you like to have the option to leave the complex by some means other than by car? I know I would. An urban center deserves a more diverse transit plan. Opening up Chippenham Parkway to non-motorized vehicles would be a the right thing to do. 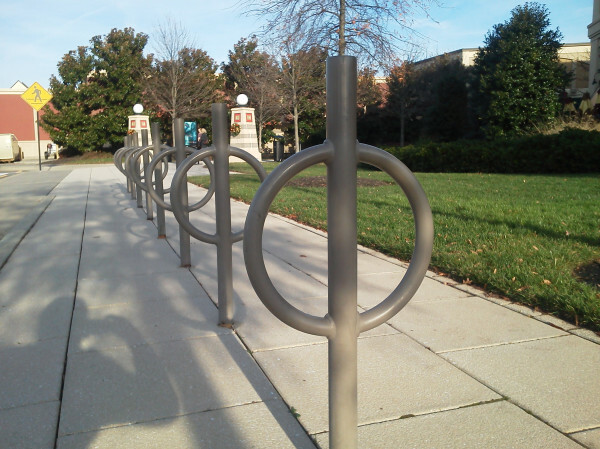 Plus, those unnecessary bike racks I took a picture of four years ago need to get used somehow. Here’s one more suggestion. The northwest border of the property (where the exit from eastbound Chippenham Parkway enters the mall) has a tall power tower running through the property. The grassy clearing that follows the power line connects to Saratoga Road, which connects to Cherokee Road (U.S. Bicycle Route 1). Build a path along that power line easement, problem solved. Currently, if someone who lives right there in the 10000 block of Cherokee Road, if they wanted to go to Stony Point by car, it would be at least a four-mile drive. If they wanted to go by foot or bike, it would be less than one mile. Any of the many cyclists who ride on U.S. Bicycle Route 1 would have a new destination along the route. Incremental improvement? Yes, but an improvement that wouldn’t cost $50 million. An even cheaper way to let pedestrians and bicyclists in would be to allow pedestrians and bicycles through the gate between Bittersweet Rd. and Creeks Crossing and to explicitly allow pedestrians and bicycles on the private road between Cherokee and the urology office. Another, not quite as cheap improvement would be to put stairs on the hill along the fence line of Creeks Crossing. The grass is worn down to dirt on that part of the hill because walkers take it up to a semi-road / semi-trail that forks off of Stony Point near Sabot. Who owns the private road that connects the medical area of Stony Point (north of Chippenham Parkway) to Cherokee? Would they allow cyclists or pedestrians to use that small stretch of road?